Harold Bornstein, the doctor who in 2015 stated in writing that if Donald Trump arrived at the White House would be "the healthiest president ever elected" given his "excellent health", but he has now acknowledged that he wrote those words at the dictation of the current top leader of U.S. "He dictated the entire letter to me, I did not write it," he told CNN television. And not only that, in another chain has revealed that his query was "looted" last year by people close to the president to seize medical reports from the tycoon, something that the White House described as a "standard procedure." The letter signed by Harold Borstein, the tycoon's head doctor for more than thirty years, was not accompanied by any clinical analysis. What was unknown then is that this bizarre shift to scientific truth was not going to be but one of the many tricks that would show a controversial character who, in spite of everything, would end up disembarking in the White House. It was the fall of 2015. The 17 conservative candidates were already on the grid. But only one monopolized the televisions 24 hours. With the wind in his favor, Donald Trump began to work with a growing core of loyal followers his legend of tough guy and indestructible man. Trump's insistence during the campaign that Clinton was not in physical condition and health to be president, made the issue became an issue of the electoral debate. A few weeks earlier, of the announcement of Trump's state of health during the electoral campaign the tycoon had tweeted that Bornstein's medical report would show "perfection." "I am fortunate to have been blessed with great genes," wrote Trump, who ended up becoming the oldest president in US history. In January of this year, and in the midst of speculation about his mental health, he went through a medical examination. The then White House doctor, Ronny Jackson, said: "I have no concern for their cognitive abilities or neurological functions." But two and a half years later, Dr. Borstein has launched himself into the media to confess his guilt. The controversial doctor, 70 years old, presumes to have held Trump's hair firm with the same grower (Propecia) that has saved his, tells how the then aspiring to succeed in politics dictated the text he had to sign at the foot of the letter. In a story that is no longer surprising, given Trump's little fondness for falling asleep, he says: "He showed up at my house at four in the morning and told me what to do." Trump's ascendancy over the doctor was remarkable, considering that his father, Jacob Borstein, had also served as his family doctor until his death in 2010. The extravagant story was reactivated in February 2017, when three people broke into Borstein's office and took Trump's medical record. The tycoon had taken possession of the Oval Office the previous month, and it was not a matter of keeping all that information in the hands of others. And less after a few days before, Borstein proudly told NBC television his miraculous work with the hair of Trump. As the doctor now explains, days later a bodyguard of the president, Keith Schiller, along with a lawyer from the Trump Organization, Alan Garten, and a third person who did not know how to recognize burst into his office. The three demanded and took in hand all the medical history of Trump. "I felt violated, scared and sad," confesses a doctor who had already lost contact with his patient long before. Dr. Borstein would have shut it all up if the White House doctor, Ronny Jackson, accused of alcoholic excesses and anxiolytic prescriptions, had not fallen out of favor. "It was a celebration for me," he acknowledges, knowing that it was he who ordered the rescue of Trump's record, as the White House has acknowledged. Although in its official version it denies that it was a "raid", as Borstein denounces. Asked about it during a press conference, White House spokeswoman Sarah Huckabee Sanders has played down the incident and denied it was a "looting". "As part of the standard procedure under a new president, the Medical Unit of the White House took possession of the medical reports of the president," Sanders has defended. There are many in the United States that take Bornstein's statements with some skepticism. He is an eccentric character, who has faced three complaints of negligence (settled with agreements before coming to trial) and that did not hide his ambitions, frustrated, to become the personal doctor of Trump in the White House and also complained, example, of the bad seats assigned to him at the inauguration of the president. 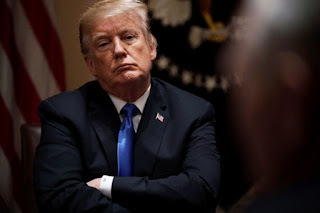 What he has denounced, however, squares with Trump's behavior patterns, which in the campaign made the health of Hillary Clinton a topic of criticism and attack and to whom the information on the medicine of hair growth effect may bother because of the impact on his image.